REDWOOD CITY, CA--(Marketwired - Jun 25, 2015) - Qwilt, the leading provider of open caching and online video delivery solutions, today announced the close of a $25 million Series D funding round. This strategic round, led by Disrupt-ive with a $16 million investment, includes new funding from Google Chairman Eric Schmidt's Innovation Endeavors and continued funding from Cisco Investments. Existing investors Accel Partners, Bessemer Venture Partners, Marker LLC and Redpoint Ventures also contributed to the round. The funds, which bring Qwilt's total capital raised to $65 million, will be used to scale the company, including the acceleration of its go-to-market strategy and support for Tier 1 network operator deployments worldwide. The company will also use the funds to support, enhance and extend its flagship open cache product, the Qwilt Video Fabric solution. "There's a fundamental shift in how online video is consumed today given the proliferation of mobile devices and emergence of new streaming business models. Qwilt's impressive team -- with extensive expertise in both networking and storage -- has created game-changing technology to solve the challenges presented by this new world order of streaming video," said Tal Barnoach, general partner at Disrupt-ive. "Qwilt is a strong fit with our investment thesis as a late stage company with disruptive technology that can scale globally." The growth of streaming video shows no signs of slowing. Fixed broadband and mobile network operators across the globe are already struggling with extraordinary consumer demand. A recent Cisco VNI report reveals that Internet Protocol video will represent 80 percent of all traffic globally by 2019, up from 67 percent in 2014. The answer for network operators can be found in a new, open architecture for streaming video, which pushes content to the network edge, close to consumers, through open caching. Qwilt has been an innovator in open caching solutions since the company's inception. 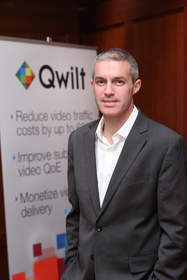 "Since we launched just a few years ago with a vision to solve the streaming video problem for network operators, the strategic value of open caching has been broadly embraced as a crucial part of the new network architecture that is required to scale online video for the future," said Alon Maor, CEO and co-founder of Qwilt. "We recognized the full scope of the opportunity early on and enhanced our open caching solution to support all types of online video, including live streaming. Furthermore, we have proactively extended our product line to address any network medium or configuration, including mobile, telco, cable and even university campus networks. This new funding speeds our ability to scale the company and get our technology deployed faster. We're proud to be included in the impressive portfolios of these strategic investors." Qwilt's sales grew 400 percent year-over-year in 2014 with more than 80 deployments of its Qwilt Video Fabric solution worldwide. In November 2014, the company became a founding member of the Streaming Video Alliance (SVA), dedicated to the advancement and industry adoption of open caching standards to ensure that streaming video infrastructure will scale quickly, efficiently and cost-effectively to meet growing consumer demand. Qwilt provides the only solution for a flexible network architecture that can both scale to support future increases in demand for over-the-top (OTT) video and enable new monetization business models for network operators. Qwilt's solution is 100 percent software-based, running on commodity, off-the-shelf hardware. Qwilt's open cache software architecture is designed to deploy easily, scale effectively and fully leverage the NFV/SDN environments being implemented by network operators worldwide. Qwilt addresses the impact of OTT video on operator networks with a unified, turnkey solution that combines open caching, video delivery and analytics technologies deployed at the subscriber edge. The Qwilt Video Fabric optimizes delivery of streaming video content to relieve network traffic congestion for operators and deliver a higher quality viewing experience for their customers. A growing number of the world's leading cable, telecom and mobile service providers rely on Qwilt to optimize their networks to support growing consumer demand for online video content as a primary entertainment source. Qwilt is a founding member of the Streaming Video Alliance, a new industry forum building the open architecture for streaming. Founded in 2010 by industry veterans from Cisco and Juniper, Qwilt is backed by Accel Partners, Bessemer Venture Partners, Cisco Ventures, Disrupt-ive, Innovation Endeavors, Marker and Redpoint Ventures. Learn more at www.qwilt.com.